Complete the width of Scotland, and back, visiting both cities in a one week holiday. Glasgow is one of Europe's most exciting destinations, combining the energy and sophistication of a great international city with some of Scotland's most spectacular scenery. 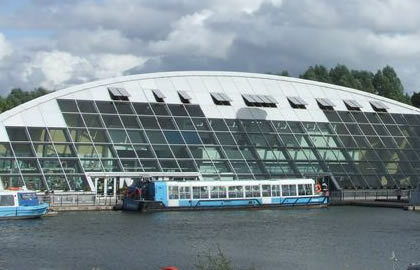 theatres offering excellent shows .The marina is adjacent to the magnificent Falkirk Wheel visitor centre. The Falkirk Wheel is one of Scotland's top tourist destinations and attracts visitors from all across the World. The Scottish Lowland Canals are quite different from the canals typical of England and Wales, and all the locks are manned by British waterways staff so you don't have to do any locks! Complete the width of Scotland, and back, visiting both cities in a one week holiday. Glasgow is one of Europe's most exciting destinations, combining the energy and sophistication of a great international city with some of Scotland's most spectacular scenery. The Scottish Lowland Canals are quite different from the canals typical of England and Wales. The Forth & Clyde Canal is much wider than the average English canal. The Union Canal is a contour canal and has no locks at all nor bridges that have to be opened. British Waterways staff currently operate all of the locks and bridges and boaters are not allowed to operate the locks themselves, although help is happily accepted. Between Falkirk and Glasgow there are 4 locks and 3 road bridges, with a further 18 locks and a number of pedestrian bridges between Glasgow and the Clyde at Bowling. (0845 676 6000) about a week before leaving home to let them know your plans. The locks are well spaced out so boaters can enjoy some of the finest views on offer with sizable hills, moorland and woodland providing a very quiet backdrop to savour . You are then on the summit reach with no more locks between here and Glasgow, but there are two more bridges. At lock 20 let the British Waterways staff know where you intend to stop for the night, what time you plan to leave the following morning and how far you intend to go that day. At Kirkintilloch it is an ideal place to stock up on provisions before the final section on the run toGlasgow, the canal passes directly through the centre of town which gives easy access to all its amenities. Applecross Street or if you are going to arrive before 5.00pm you can go down to Spiers Wharf. Bridge opened for you at Applecross Street. There is no shortage of ways to spend time in Glasgow, once Europe’s city of culture, a large amount of money has been spent redeveloping the city centre and old brownfield sites. There are numerous museums, parks, golf courses, shopping centres and restaurants in and around Glasgow and much of the city centre activities are within walking distance of moorings at Spiers Wharf. You should book the Falkirk Wheel about a week before you leave home by calling British Waterways (01324 676912). Set off from our base 20 minutes before the time you have booked. We will open the pedestrian bridge for you. Once you have passed through this bridge, turn immediately into the lower lock, which should be set for you. The British Waterways staff will tell you when to proceed across and into the gondola of The Wheel. Enter the gondola and someone at both the bow and stern should go onto the walkway and tie off the boat. Everyone should get back onto the boat whilst The Wheel turns. British Waterways staff will tell you when to leave the gondola. What better way to start a canal cruise than by ascending twenty-two metres up on the iconic and unique Falkirk Wheel? For many waterways the rest of the journey would be an anti-climax but as the canal was built to follow a seventy-three metre contour along its thirty-two mile length the requirement for aqueducts produced three, and to top it all the canal winds through beautiful lowlands scenery and leads directly into the heart of the incomparable city of Edinburgh. If you are lucky enough to have clear and sunny conditions the views over the lowlands from the slowly rotating Falkirk Wheel are astonishing, being Scotland though, the chances are the weather is not so good so cross your fingers well in advance. The canal leaves the wheel on a modern aqueduct elevated above parkland looking out over gorse bush thickets and woods, the newly built Roughcastle Tunnel looms, takes the canal under woodland for a short way before coming out to a severe right-angled left turn and going immediately into an equally new two lock flight which are the only locks found on the Union Canal. There are spots to moor after the locks with open ground to the right to explore and take in the views, there is a small aqueduct named Greenbank just a little further on with some more spots to moor up giving convenient access to Summerford Park on the north bank and Tamfourhill and Canada Woods to the south, but the railway line that runs directly parallel to the canal may dissuade you from spending the night. The canal veers to the right at a wide spot and plunges in to the Falkirk Tunnel, quite refreshingly after the somewhat sterile looking locks, aqueducts and tunnel so far. This is an original feature of the canal full of character being part brickwork and part natural rock, the end result is getting dripped on down its 640 metre length. There is an equal mix of wooded, industrial, agricultural, urban and heathland scenery as the canal heads eastwards away from Falkirk past Brightons and Polmont. After the crossing of the A801 the canal and railway line part ways and the canal winds in a more south easterly bearing through a very open rural area towards the twenty-six metre tall twelve arched Avon Aqueduct, at nearly 250 metres long it is the second longest in Britain. On the approach to the aqueduct the trees flanking either side of the canal block much of the view of the wooded rolling hillsides beyond the aqueduct, more of the view is unveiled the closer the canal gets until the threshold of the aqueduct when the whole vista is unfolded. Good news for sufferers of vertigo, unlike the Pontcysyllte Aqueduct on the Llangollen Canal that only has railings on one side and a heart-stopping drop on the other, there are railings and brickwork towpaths on both sides of this towering structure as it carries you high over the valley floor below. There is a short journey towards Linlithgow from here, the winding high street is full of character and plenty of choice for restocking provisions but by far and away the highlight of this pleasant little town is the staggering loch side fortified palace and adjoining church of St Michael. Whichever angle you view the palace ruins from it is astoundingly beautiful, the mind boggles at the sheer opulence of the castle and the surroundings and views offered up, very much a place I would like to have seen in its prime. The canal is bordered by trees at almost all times but beyond Philipstoun it traverses through some really dense woodland reaching over the waterway in places and is full of wildlife. It is regrettable that the railway that latched on to the canal at Linlithgow is not shaken again until near Broxburn, other than that the M9 gets a little close for a while, but with a thick belt of trees following the course of the canal almost constantly between Philipstoun and Winchburgh the canal is cossetted away from a lot of the noise and disturbance beyond. There are not much in the way of amenities in Winchburgh but just to the south of the village is a golf course which is easy to spot as right in the middle sits the shell of Niddry Castle, another fortified grand house, nowhere near the scale of the palace in Linlithgow but is very striking and worth the small walk to explore. The canal meanders somewhat in the area as it heads southwards away from the motorway, it is after all a contour canal and such twists and turns are to be expected. The fishing between Philipstoun and Broxburn is very good as it is along the whole canal, it is quite common to catch perch and roach throughout the Union. There is an opportunity to shop for provisions at Broxburn, there is a large industrial park to the east of the town that the canal winds directly past, the way out of the town is more scenic than the way in, winding through arable farmland. A mile or so out of Broxburn the canal passes under the M8 motorway and moves away a little towards the wooded valley spanned by the Almond Aqueduct, although smaller than the Avon Aqueduct it is still an impressive 128 metres long and twenty-eight metres high with a five arched construction, but what is no less impressive is the terrific views over the wooded valley and river far below and far reaching views to the south. Much the same as the Avon Aqueduct there is a brickwork towpath to each side as well as very welcome railings . Regrettably the canal traverses alongside the M8 for some time, the bank of trees thickens somewhat on the way into Ratho bringing some relief from the incessantly noisy road. Ratho offers some amenities including a post office, a couple of convenience stores and a pub all within a very short distance of the canal. There is a golf course alongside the canal as it plunges back into a thicket of trees around the northern flank of the golf course and back into arable land beyond as the canal approaches the very modern Scott Russell Aqueduct crossing the busy A720 dual carriageway, after which the canal follows the road for a short time before turning away into the outlying residential suburbs of Edinburgh. The canal winds through open parkland, a golf course, housing estates and some very modern high rise apartment blocks through to the older areas of the city to reach the terminus of Lochrin Basin in the heart of historic Edinburgh. The basin gives easy access to the sights of Edinburgh, Princes Street, Edinburgh Castle and the wonderful views from its grounds, The Royal Mile and more pubs and restaurants than could be frequented in a month. A few days can be filled easily here before heading back westwards and experiencing the relaxing delights of the Union Canal once more. If you are coming from the west along the Forth & Clyde Canal, it is best to contact BritishWaterways (0845 676 6000) to book your passage through the Wheel. The latest point to dothis is when you pass under Bonnybridge Road Bridge. Similarly, if you are coming from the east along the Union Canal, the latest you should phone is when you have cleared the Falkirk Tunnel and before the Seagull Trust boathouse.